We are grateful to Di Maynard for snippets from her family history. I was very interested to read about The Swan at Arborfield on your website. I thought you might like some info on my great, great grandfather, Richard Maynard, who was landlord of The Swan in 1842, as given in your listing of former landlords. Of course, you may know all about him already! The earliest record discovered, so far, of the landlords of The Swan, can be found in Snares Directory of 1842, where a Mr Maynard is listed as landlord (but in the 1841 Census he was described simply as a ‘cordwinder’ though with three people lodging with him and his wife). I know from records that Elizabeth Pitcher was the licensee in 1853 when the rent was Eight guineas per annum (£8.40p). Here is more about my ancestor and what happened to him and why he did not carry on as landlord for long. A Thomas Chandler held the post in 1847. According to the 1841 census Richard Maynard was born around 1805 in Hurst, Sonning, Berkshire. The IGI Familysearch website states he married Caroline Brown (born c.1807) at Windlesham, Surrey, on 19 December 1831. There were no children of the marriage. Unfortunately, Caroline, died in the Oct-Dec quarter 1841 but shortly afterwards he remarried a Harriett Greenaway on 20th June 1842. The marriage certificate shows his occupation as ‘Innkeeper’ at Newland’. Harriett was born in Sonning c.1814. Their first son George was born 28th May 1845, and his birth certificate shows the family living at Shinfield. (I am a direct descendant from son George). Another son Richard was born in 1847 and daughter Harriett arrived c.1850. Sadly, Richard passed away in December 1850 leaving his three young children fatherless. In June 1853 Harriett marries again, to a Henry Payne, a ‘brewer’s servant’, and they have a daughter, Elizabeth in 1854. I hope this information will be useful for your files. I thought you might also like to see this old postcard of The Swan which I added to my Maynard family history files some time ago. There is no publisher shown nor a date of posting. However, the ½d stamp price shows it was issued prior to June 1918, as from that date the postage doubled to one penny. 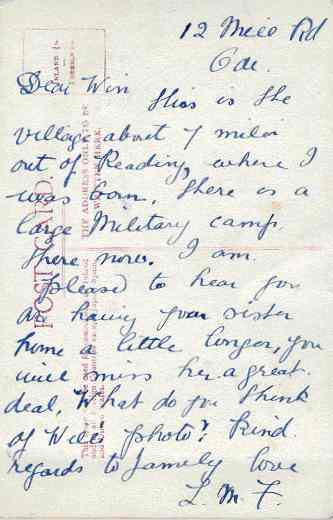 The message on the reverse is interesting but no name given, just Will and Win and the sender ‘LMF’. 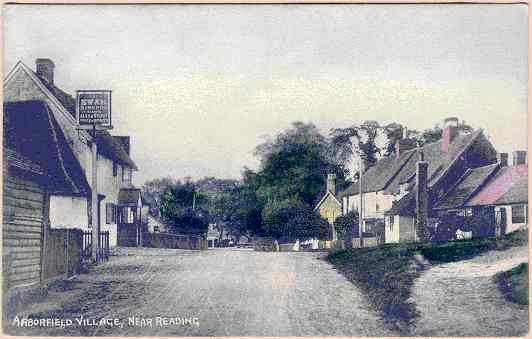 This is the village about 7 miles out of Reading, where I was born. There is a large Military camp there now. I am pleased to hear you are having your sister home a little longer, you will miss her a great deal. Arborfield Local History Society has searched through the baptism registers for the late 1800s and the FREEBMD website. There doesn't seem to be find a match for the initials 'L.M.F. ', or for anyone with the initials 'L.M.' or 'L.' who married prior to 1920 to anyone with a surname beginning 'F'. 'Odi' could possibly be 'Odiham', but there is no 'Mill Road' in that area.